Once upon a time, there was King Arthur and the Knights of the Round Table. There were also the Rabbits of the Round Table. They were the forebears of the Royal Rabbits of London who now live in the Grand Burrow beneath Buckingham Palace, protecting the Royal Family from danger, although they don't know it. Meanwhile out in the country, lives Shylo Tawny-Tail, a shy yet curious young rabbit. He's the runt of the litter and often teased by his many brothers and sisters. His mother worries that her children might be caught by one of the dogs that roam the farm, and she worries for Shylo most of all. Despite his timidity, Shylo has a rather adventurous spirit, and has taken to visiting the reclusive Horatio, who shares tales of the mythical Royal Rabbits with him. When Shylo accidentally overhears a conversation, he is horrified to discover there's a plot afoot to embarrass the Queen. The Ratzis are behind it all and they want to get a photo of the Queen in her nightie. They're paparazzi rats! Can Shylo help foil their plans? Where would he even start? You never know what can happen "by will and by luck, with a moist carrot, a wet nose and a slice of mad courage." Through his experiences, Shylo discovers he has more courage than he realises, and that as long as you try your best, and be your best, that's all that matters. Join Shylo on his adventure and you'll meet Horatio, the Ratzis, Clooney, Zeno, the Pack and others. Like most children, Shylo has dreams, fears and a well-developed imagination. He learns that sometimes you need to take risks, and that when you do, anything is possible. This is the first children's book from Santa Montefiore and Simon Sebag Montefiore, who are each known for their best-selling books for adults. The story of The Royal Rabbits of London was inspired by their son who told them he loved rabbits and when asked where they lived, said it was under Buckingham Palace. The story is complemented by fabulous pen drawings by Kate Hindley. On her website she's shared a video you can watch to learn how to draw your own Shylo, which I recommend giving a try. The book itself has been beautifully designed, with black rabbit footprints throughout, carrot-patterned endpapers, and a cover featuring gold foil embellishments. 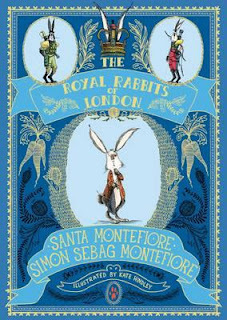 I thoroughly enjoyed The Royal Rabbits of London and eagerly await the sequel, expected later this year, to find out what Shylo and the other rabbits get up to next.